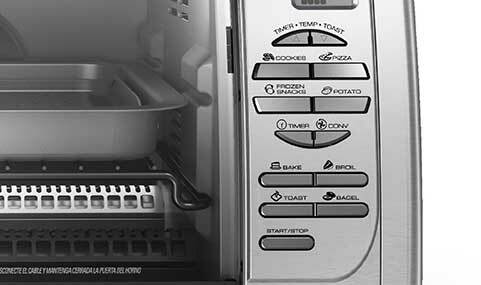 Cooking versatility at the touch of a button! The BLACK + DECKER™ Countertop Convection Toaster Oven features one-touch functions for a whole range of foods: bagel, pizza, frozen snacks, potatoes, and cookies. Convection baking circulates hot air around your food for fast and even results, and the extra-deep curved interior fits 12" pizzas and so much more. Forget about heating up the large oven. This countertop oven is designed to fit 12” pizzas, and things like casserole dishes, whole chickens, and more. 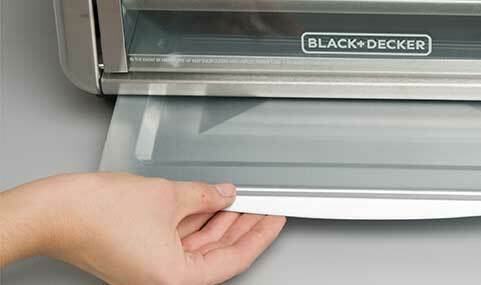 Place food right under the broiler or make room for large items. High and low oven rack positions provide the versatility to have great results on all foods. Bake, broil, toast, bagel, pizza, frozen snacks, potatoes, cookies. 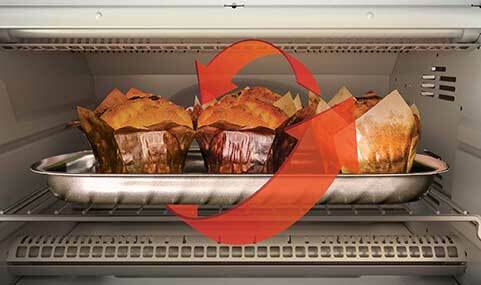 Hot air is circulated throughout the oven for fast, even baking. Prevents burnt crumbs and keeps the counter clean. Countertop Convection Toaster Oven is rated 3.6 out of 5 by 72. Rated 1 out of 5 by MeganJH from Digital display Doesn’t work! I got this for my wedding shower in February. We just hooked it up about 2 weeks ago and the digital display is messed up. Because it was a gift - I have no receipt or anything. I love the oven but extremely disappointed about the display not working!!!! Rated 5 out of 5 by Sherr1215 from I absolutely love this oven. I bought this oven so I could use the old one I have in my RV. I love it so much that I use to take the old one and bring it back every time we traveled. Well now I have 2. No more toting back and forth. Rated 1 out of 5 by Hilary from Start Button Stopped Working I've had this oven for about 2-3 months and it has worked great up until this week. After pressing one of the function buttons such as "bake", I then push the start button and it turns the whole thing off. Usually once I press the start button it will begin preheating, but I can no longer get it to turn on. Rated 1 out of 5 by Rebekah from Wrong Dementions I got this shiny new toaster oven yesterday. It’s beautiful, but the dementions are all wrong! I would constantly use my old Black & Decker Toaster Oven to bake casserole and other things for my family of 5. The dementions listed for this unit should accommodate my needs, but they are wrong. It’s several inches smaller than described. It’s seriously the only reason I bought the unit. It’s not useful to me being this small. Not at all happy with the false advertisement of this item. I’ll most likely be returning it tomorrow. Rated 3 out of 5 by Ali77 from It was great until I loved the toaster oven for the first year until the temperature bottoms stopped working. Unfortunately you can’t use any cooking options if you can’t change the temperature. Very disappointed in the quality. I would have expected at least a few more years. Rated 1 out of 5 by jrthrash from Incorrect size specifications I ordered this toaster oven for my wife since she wanted one with more height than the one we have. The advertised size/specifications is L 22.8 x W 13.4 x H 15.5 inches. The actual size/specifications is L 19.25 x "W 13.4 x H 10.5 inches. How come you advertise a larger size when the actual size is much much smaller. I would not recommend this product with the wrong size/specifications. Rated 4 out of 5 by Pinkie from Great unit. Purchased as a replacement for the same exact unit I had been using for a number of years. Rated 3 out of 5 by ctouser from Temperature Change buttons not working I have had this oven for few years now and love it. However since a long time now temperature change buttons for increasing or decreasing the oven temperature have stopped working. It is really a big disappointment. What can be done about that? Hi! Do I keep the black plastic Bumpers on the back of the toaster oven on or take &nbsp;them off? How come your size for the CTO6335S toaster oven is actually smaller than the size you indicate in the specification or oven description? I ordered one from Amazon and the actual size is L 19.25 x W 13.4 x H 10.5 inches. Length of power cord on Black &amp; Decker Convection Oven DTO6335s? Are the dimensions listed External or Internal? The High temperature listed is 400 yet the user manual shows 450 for broil? What is the wattage? Why do people burn their hand opening the door? Great oven but now the up/down push buttons often fail to respond so one can't set the baking temperature anymore. Is there an easy way to fix this? how to set timer for toast?